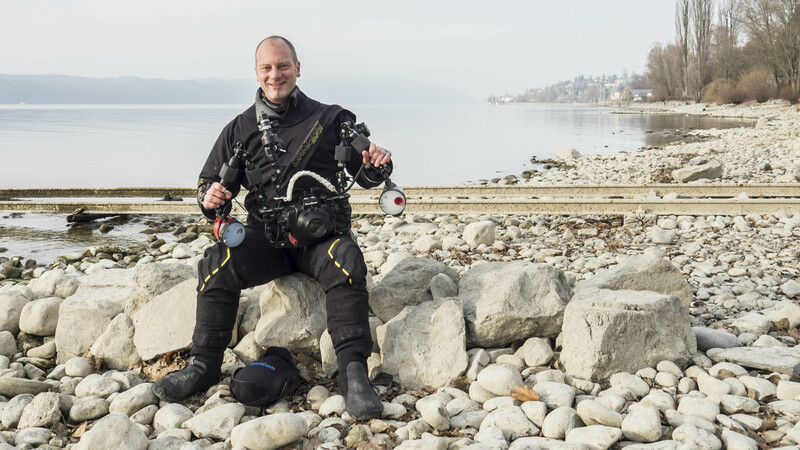 The Underwater photographer Joerg Lietzmann lives in Langenargen at the Lake of Constance ( Bodensee ) in Germany. Here he also run together with some friends the dive school Scuba Do. As Diving instructor and enthusiastic diver time underwater feels always right. Langenargen, situated right at the lake Bodensee, and a dive spot not further away than 5 minutes offer lot of chances to follow live in fresh water and to save impressions in pictures. But also the Mediterranean and tropical oceans with their curious inhabitants have a deep impact in the live of the photographer. It started all with a small compact camera. Over the years photo equipment got bigger and also the underwater equipment itself got more extensive. In the meantime Joerg Lietzmann use a DSLR of Canon, the EOS 70D, with a Nauticam housing and a Olympus OM-D EM1 in the Olympus housing.